One of the best ways to make the most of your grocery budget is to ensure that leftovers don’t sit in the refrigerator and spoil. Our grandmothers possessed this skill, but it seems to have been lost over the years. One of the complaints that I frequently hear from people is that their family members don’t like leftovers. Another complaint I hear is how expensive meat has become. My solution to both of these problems is the Leftover Makeover. First, purchase fewer pieces of meat during your weekly grocery trip. Then, turn the leftovers into something different, and your family may never notice. In this post, I will share my strategy for using leftovers without boring my family by serving the same thing more than once. This week’s Leftover Makeover features an oven roasted chicken and a slow cooker pot roast. Before I begin with our menu plan, let me tell you that we are a family of 5. Four eat like adults, one does not. One of my children is more of a meat and potatoes guy. One of them prefers vegetables to meat. Regardless of these idiosyncrasies, this works for our family. With a little modification, it can work for yours, too. I got the idea for using only two pieces of meat from Tawra and Jill over at Living On a Dime. Jill raised her two kids for several years on only $500 per month, and she shared that she would only buy two different meats to last the week. I was intrigued by this idea, and deliberately set out to do this for one week while also avoiding any complaints of “Leftovers again?” I think the week went well. The weekend is when I am able to cook more complicated meals, so I began the week with a roasted chicken. If you prefer, you can “roast” your chicken in the slow cooker while you’re at church. I didn’t add the potatoes to the bottom of the pan as in the photo. Instead, this was served with rice pilaf (from a family sized box), roasted baby carrots, and a side salad. Since it was Sunday, we even had dessert. My favorite simple winter desserts are peach cobbler made from canned peaches and apple crisp. There was leftover chicken and leftover dessert, but that was all. This was stored in the refrigerator. 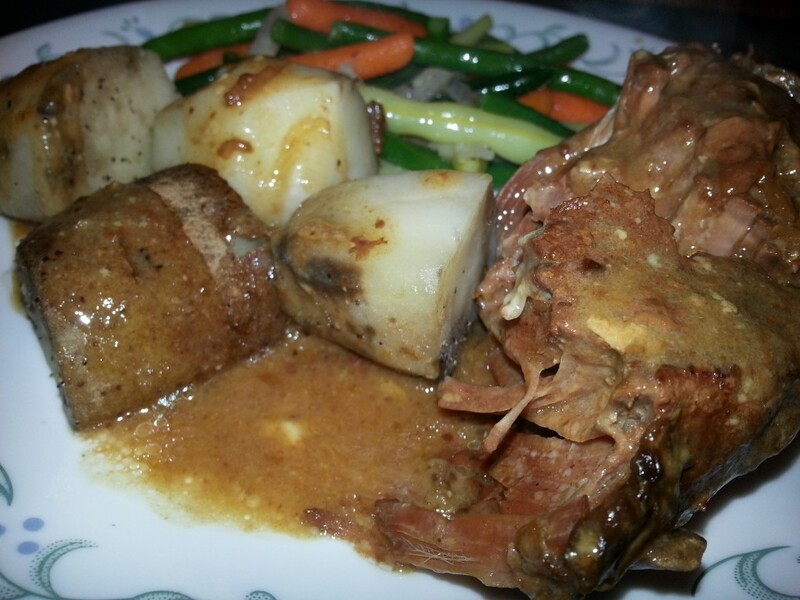 We prepared Three Ingredient Slow Cooker Pot Roast on Monday. Since the roast cooked while I was at work, it was a simple thing to prepare a batch of mashed potatoes and cook some vegetables to serve on the side. Occasionally, I make this by cooking potatoes in the slow cooker with the roast, but not always. For this week, I opted to cook the potatoes separately. We had mashed potatoes with some of the gravy on top instead of the potato chunks that are featured in the photo. I also cooked some frozen vegetables to go with it. Of course, there was still dessert leftover from Sunday, so we all had a piece of that. After dinner was over, we had some leftover mashed potatoes, and quite a bit of leftover pot roast. I saved the pan drippings in a separate container to use in a dish later in the week. Often, when we are using leftovers during the week, I will alternate between the leftover dishes and something else. In this case, I was able to alternate between chicken and beef recipes for the week. This prevents monotony which frequently results in whining during meals. Tuesday, we picked all of the remaining meat off of the chicken carcass. 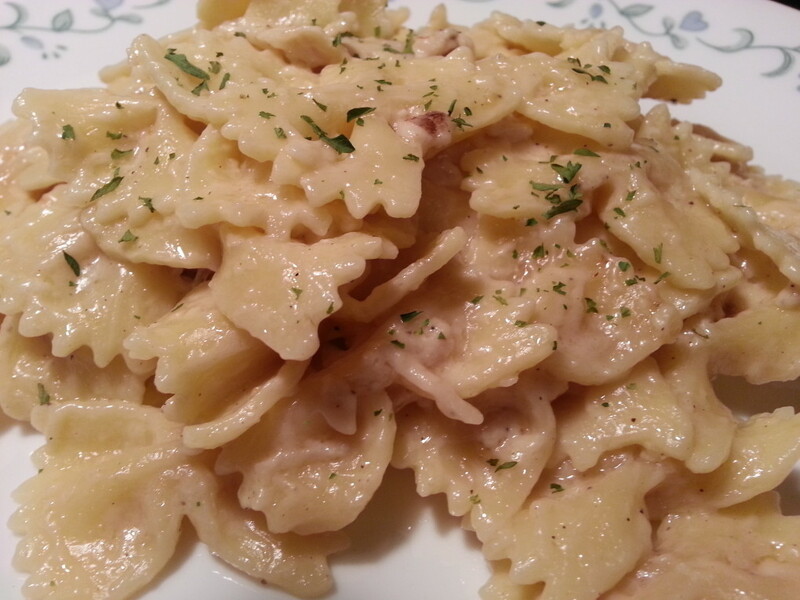 The leftover meat was a little under the two cups that the recipe says is needed, but we prepared pressure cooker chicken Alfredo with what was left. It was served with some steamed broccoli, a salad, and garlic bread. The nearly naked chicken carcass, along with the skin was returned to the refrigerator, and Wednesday morning, the chicken carcass was placed in the slow cooker with some carrots, celery, onion, salt, pepper, and a bay leaf. It was cooked on low all day long, but that wasn’t for dinner. 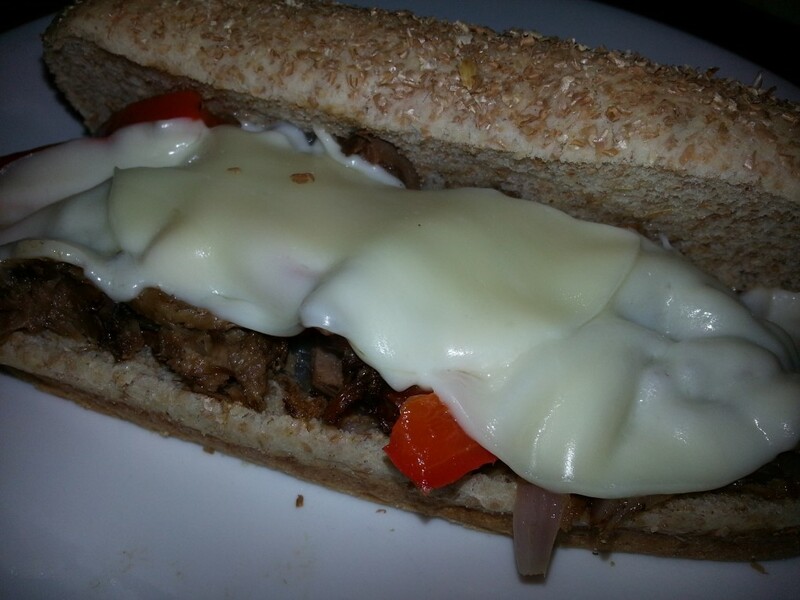 Wednesday’s dinner was beef and pepper sandwiches made from the leftover pot roast. 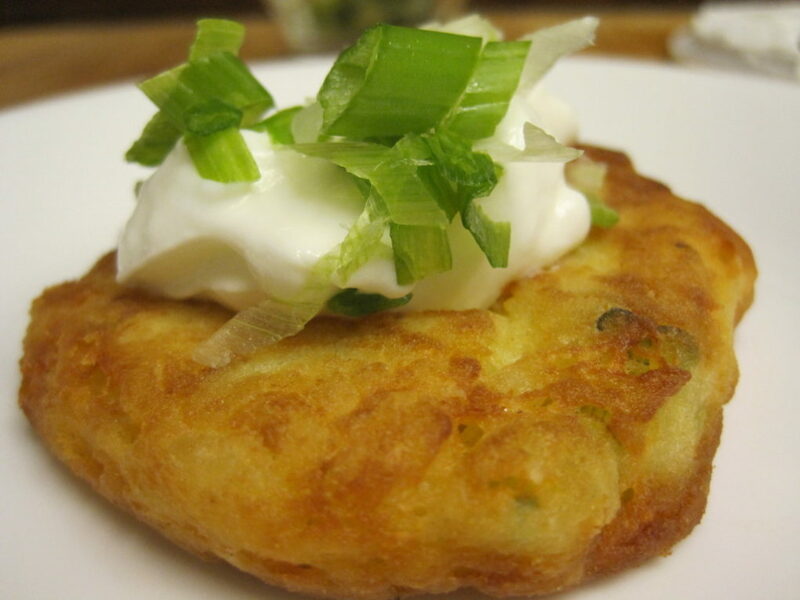 We served these with fully loaded mashed potato cakes. 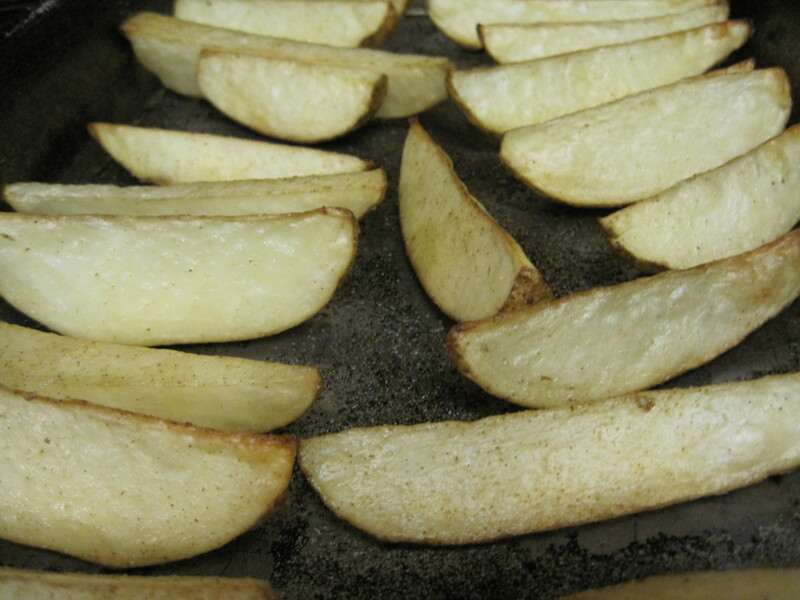 Since our boys can eat a lot, we also made some extra seasoned oven fries. Thursday, would ordinarily be leftover night in my house, but since we are demonstrating how to use leftovers for people who don’t like leftovers, we switched back to the pot roast. 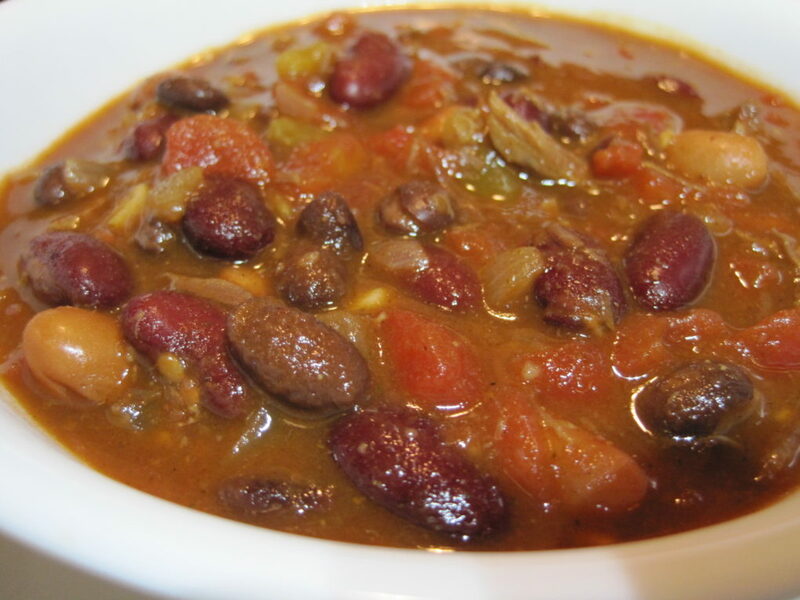 The leftover meat was chopped, and added to a pot with the leftover pan drippings, along with all of the ingredient’s necessary to make a pot of chili con carne with beans, substituting the leftover meat for the two cans of roast beef. If you want to be lazy, you can leave out the cumin, oregano, chili powder, and cayenne, and season it with a package of taco seasoning mix instead. If you don’t have the spices already, this may be a more economical way to go. 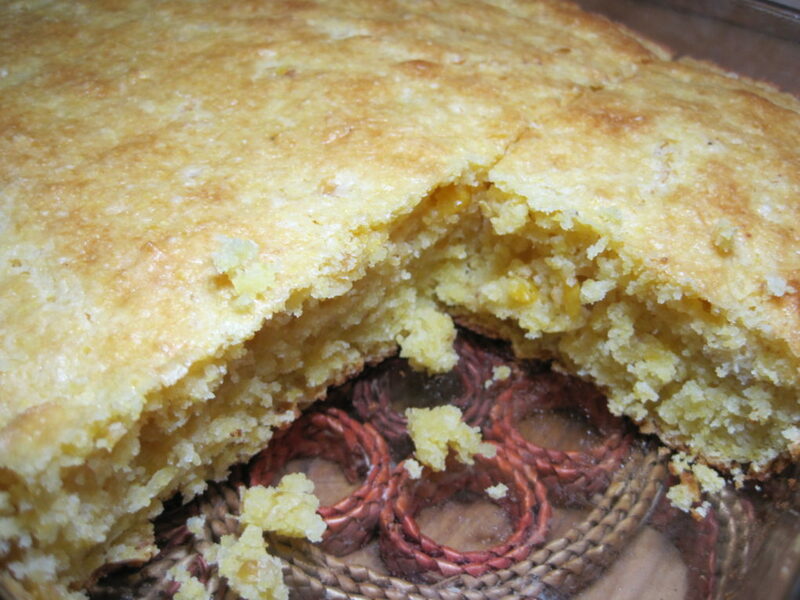 We served our chili with a pan of moist and delicious corn bread. Friday has options. Because we associate Friday with fun food this might be a good day to make some nachos, like these baked chili cheese nachos, from the leftover chili, or this might be a good day to have a baked potato bar with chili as a topping. Both of these are favorites with my children. 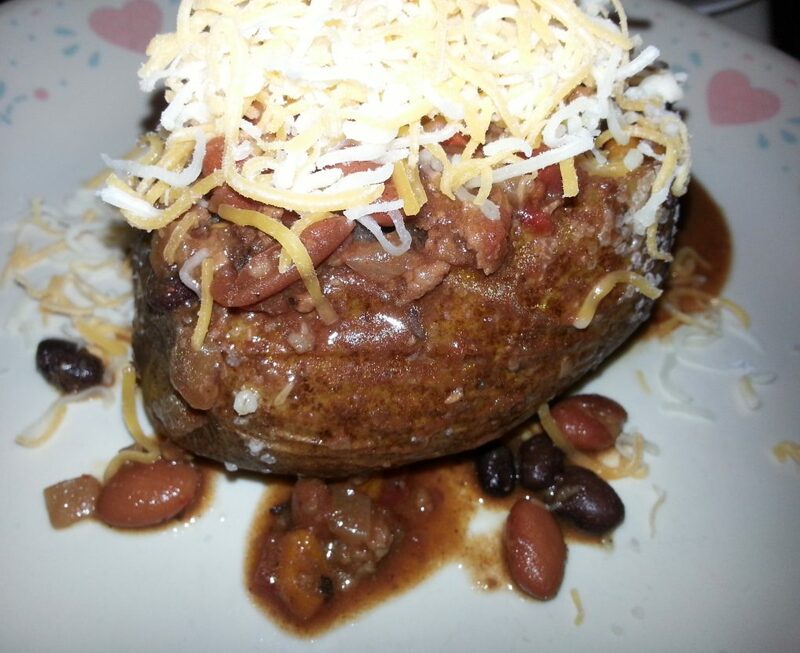 You can find the instructions for making perfect baked potatoes without using foil here. If you prefer, you can also use the leftover chili to make chili mac if you’re not opposed to more than one pasta dish in a week. This brings us to the final day of our week. Remember that chicken broth from Wednesday? It’s time to make some chicken soup. Before you begin, take out the solids that you saved in the refrigerator, and sort through it (unless you did this on Wednesday evening.) Bones go into the trash. In my house, skin, fat, and pieces of cartilage go into a bowl for me to give to the dogs later, but you can throw those away if you don’t have dogs, or if you don’t feed your dogs human food. My dogs also eat the mushy carrot pieces. The onions and celery from the slow cooker broth go into the trash. All of the little pieces of meat that came loose from the carcass will go into the pot for the soup. At this point, you have options regarding what type of soup that you want to make. 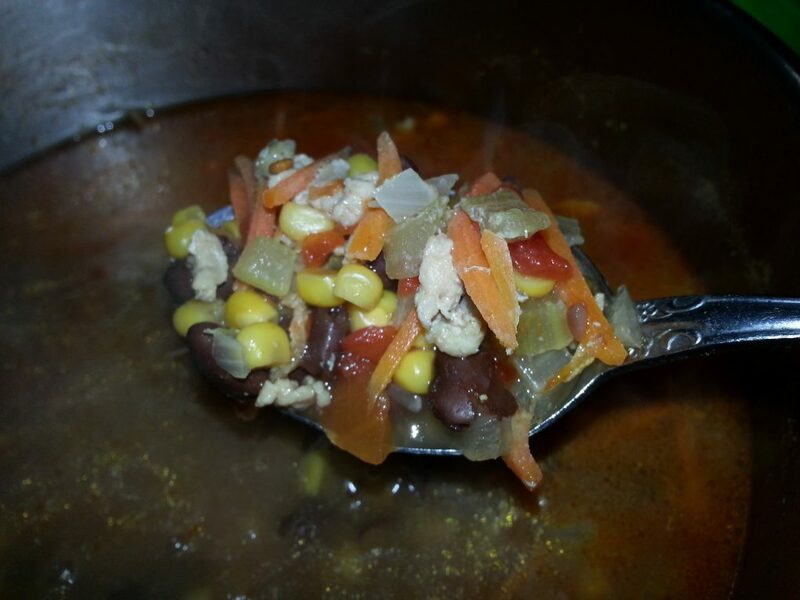 We were still in the mood for southwestern flavors this week, so I prepared a pot of chicken tortilla soup using the meat from the chicken carcass and the broth. Whatever meat was left from the carcass was the only meat I added to the soup. The homemade broth adds an amazing depth of flavor to the soup that you won’t get from canned broth. 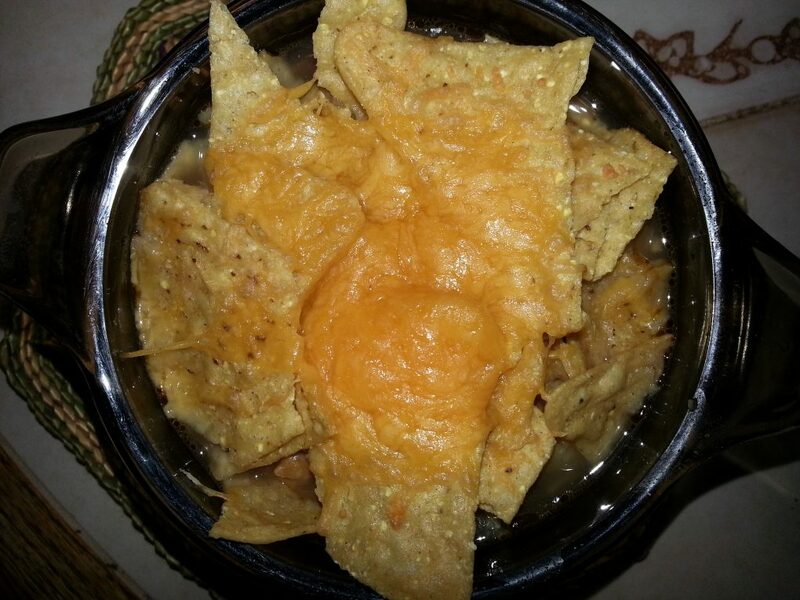 This soup is served smothered with tortilla chips and melted cheese, so it’s pretty filling. We frequently have this with just a side salad. Other times, we serve it with some quesadillas. For this week, we had a salad. That finished out our week’s worth of meals made from only two pieces of meat. The pot roast was on sale for $2.29 per pound, so the nearly six pound roast cost $13.69. The chicken was NOT on sale this week. I paid $5.09 for a nearly 5 pound chicken. This meant that $18.78 of our weekly grocery budget was spent on meat. The rest of the money was spent on the fruits, vegetables, and other ingredient’s needed for these meals as well as food for breakfast and lunch. When we cook, and shop in this way, it’s easy for us to stay under our $84/week grocery budget without feeling deprived and without eating the same thing over and over again. We used any little bits of leftovers, beyond these meals, for lunches because we are determined to cut down on food waste in our house. If we throw away good food, or let it spoil, we might as well be throwing away money. Did you know that the average American home throws away 10 – 40% of the groceries that they buy? If you’re interested in tips to help you save money on your weekly food bill, check out this post for 12 ways to save money on your groceries. Now that the week is finished, I need to figure out next week’s meal plan. I’m thinking about a week using ground beef or turkey. What do you think? If you enjoyed this post, or have questions, leave a comment below. You know when I was a kid I hated leftover. NOW I LOVE leftovers. Always have fun trying to make great meals cleaning out the fridge. 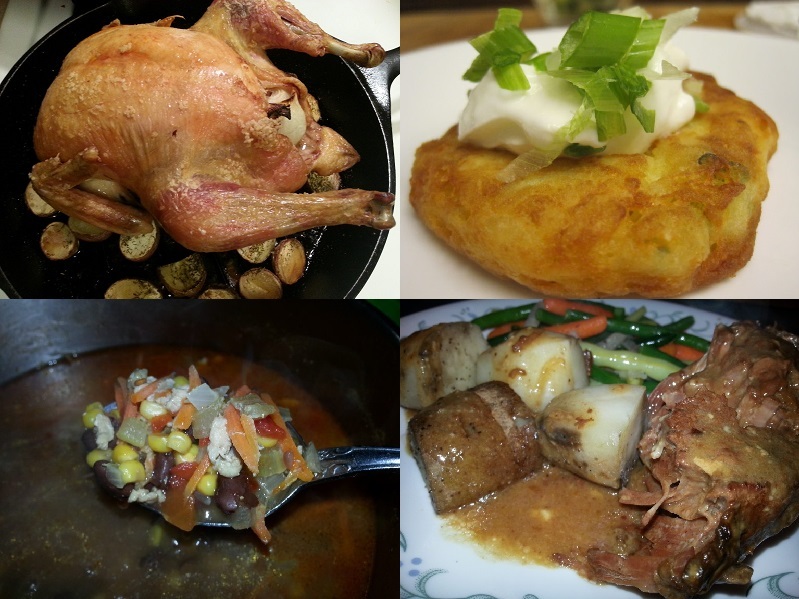 I love this glimpse into your menu for the week and this approach to using up leftovers! It’s a great way to reduce food waste too and I love all the wonderful sides that you served! Thank you, Amy. I love repurposing leftovers, and transforming them into something different. I also try very hard to ensure that I feed my family a balanced menu. I used to be really intimidated by working with leftovers, but now I love ’em! Great tips for repurposing leftovers and cutting back on kitchen waste! Ashley, I hear from a lot of people that leftovers intimidate them. I’m glad that you love them now. It’s good for other people to read that they aren’t alone. If you conquered leftover use, they can, too. Waste not want not is our motto, so we always eat leftovers “reinvented”. Great ideas, here! My hubby loves leftovers. I tolerate them, but you have made them look enticing and delicious!! Elaine, thank you for the compliment. It’s funny how different people react to leftovers. My youngest son, Food Critic, is always opening the fridge to see what’s inside. I always smile when I hear him say “Yes. Leftovers!” with enthusiasm. Unfortunately, not everyone share’s his excitement. That’s why I love to transform them into something different. Preventing food waste is one of the easiest ways to lower your grocery bill. Love how you turned leftovers in delicious meals, well done! Thank you. I really like the challenge of recreating something new from what we have left. My husband has been known to skip leftovers in favor of a protein bar. I, however, LOVE leftovers. This post was a clever way of addressing that issue! LOL Serving leftovers in a new way is one of the most important skills a home cook can develop! I was either single or cooking for two most of my adult life, so I had to learn just for myself – makes no sense to make something new each night. A chicken that’s been roasted, or boiled, is a very versatile meat. It’s amazing all of the things you can make from that one little chicken. I love that it’s a fairly inexpensive meat, too. I love the whole frugality challenge! 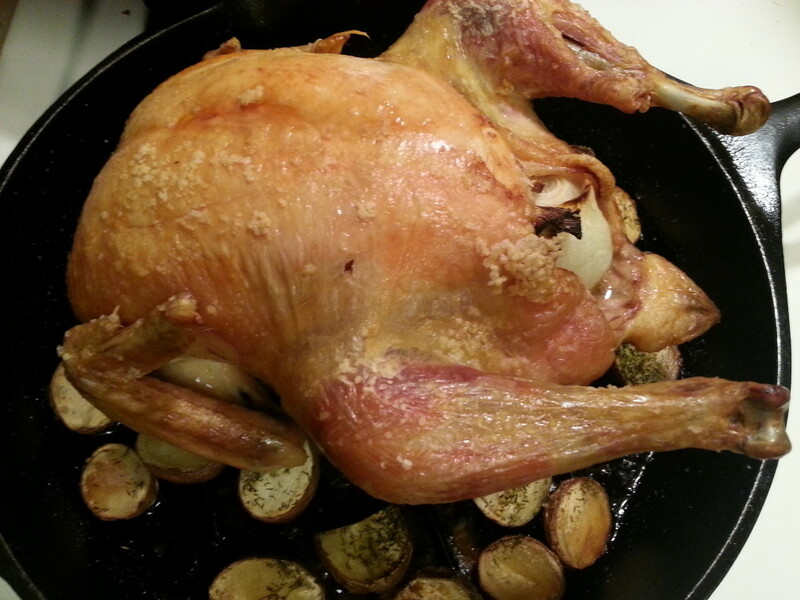 My daughter lived alone while on an internship and she would get 1 week out of a whole roaster chicken! My mom and grandmother could do that, but while feeding a whole family. My daughter tried to see if it was really possible as a school project a couple of years ago. She managed to feed our family for a week from one chicken. I will have to see if we can find that paper. That might make an interesting blog post. I always have so many leftovers with shooting recipes for my blog (and only having two people in the house), I’m always looking for creative ways to use them! I feel your pain, Leslie. When I’m trying to perfect a recipe, we sometimes get buried in leftovers, too. This always happens in April when I do a “30 days of” challenge because I’m making a new recipe for every day of the month. If the leftovers freeze well, I’ve been known to turn them into homemade frozen dinners to take for lunch. Otherwise, I try to transform them into something else. I love this and you nailed it by saying, “One of the best ways to make the most of your grocery budget is to ensure that leftovers don’t sit in the refrigerator and spoil.” I’m so guilty of this!! Gosh – I needed this article! Some great tips and takeaways on here!! Amanda, thank you for your kind words. I’m so glad you found the information in this article useful. I probably sound like a broken record, but the average American household throws away from 10 – 40% of what they purchase. If you spend $400 per month on groceries that means you’re throwing away between $40 and $160 per month. That’s a lot of money to be sending to the landfill. This looks so good! I can’t wait to try your recipe! I’m glad these recipes look good to you. Great tips! I always HATE to throw food away but if it goes to the chickens I guess it’s not totally throwing it away. I keep trying to reduce waste though! Freeze it before it goes bad. I know what you mean. We have dogs, chickens, etc, so very little makes it into the trash, but some of our kitchen waste can make for some expensive pet food. Freezing is a great idea. We freeze a fair amount of leftovers, too.